Please use the roadmap Kranzparkhotel or the route planner. 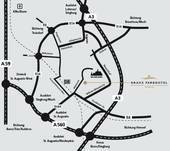 With our route planner, you're guaranteed to find the quickest route to the Kranz Parkhotel. Have a good journey!